I had dinner last night with two former staffers, Jen Jones (yes, we share the same name!) and Frances Palladino-Zahaitis. Jen picked a great spot called Cliff’s Edge in Silver Lake and as always, we never run out of things to reminisce about. 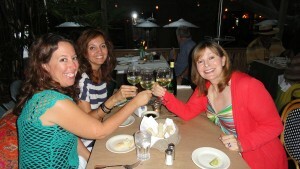 But this time, we were there to toast Jen’s upcoming wedding. (she’s the one in the turquoise top) Jen has found her soulmate and we are all so happy for her. She’s getting married next month and then off on a romantic honeymoon. All the best to Jen as she starts her new life! My favorite thing is to hear from former show staffers and see what everyone is doing now. Most of them are still working in television, three of them at Oprah, and a whole bunch in L.A. I don’t hear much from the old crew in Chicago – Mike, Billy, Hippie, Joe, Rich…. How about it? 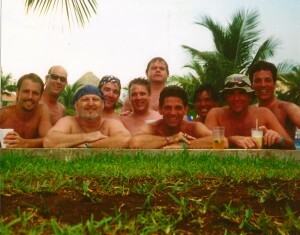 Remember this staff trip to Cancun? Drop me a line!